Lindamade » My second knit hat! Last night I started my second knitting class, which was knitting in the round. Very simple! I don’t know why I waited this long to knit, but I am so excited about the stretchiness and non-bulkiness. And changing colors is so easy! It’s fun to be figuring things out again. Hooray. I always make a new year’s resolution to take a class, and I always follow through. There is nothing like learning, I tell you! Next monday, we will learn how to use double pointed needles to decrease. While I’m sure I can figure it out, I’m going to let it sit and work on something else in the meantime. Like the baby quilt for my sis, the top of which is nearly done. omg! i love that hat. 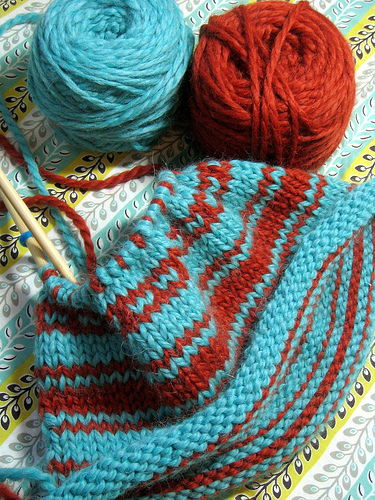 DPNS are so much fun once you get the hang of them- i felt like a "real knitter" when I first used them (though I am definitely not a real knitter!). and i am SO with you on learning new things-- very few things are more satisfying.